Another processed today for the first time... This young lad was in a group of four young males. D300 1/125 F5 500 F4. ISO 400.. cropped a very small amount off the top. Great portrait, David! I can almost hear him. "[P]rocessed today for the first time..." Hard to believe this handsome image has been asleep. A fantastic portrait, Dave. 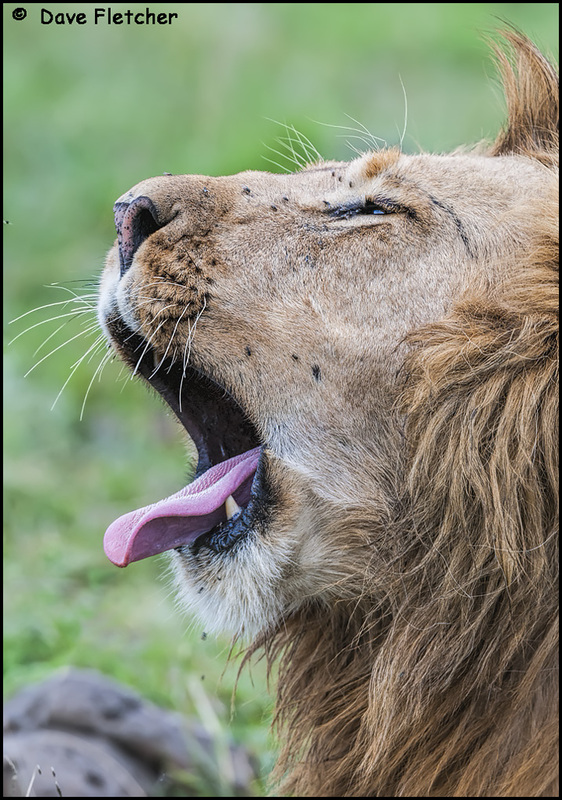 The yawn, the tongue, and the facial detail (including the flies) are all first-rate, and make the image for me. Excellent. Am properly guilty Ron. Just going through more images.... Bit of an eye opener as what I wanted back then and what I see now puts me in the (oh dear, prat category...lol). I'll show a few more this week. You know by now I'm not an often shower of images and personally more comfortable with just being there, but going over my files, there are quite a few that I have looked at and am now wondering why that's not saved to my image bank. If there's one thing that lions do really well - its sleep. A lovely intimate view of this young sleepyhead enjoying a nice yawn. I'm glad you're going through some forgotten files, and finding some hidden gems, like these, Dave. That’s great, Dave. Looking forward to more. Wonderful yawn/close-up Dave. I'm glad you're showing us your "old" stuff- just delightful. Eagerly looking for more. I love it when a surprise, overlooked old gem pops up. Super, intimate portrait! Excellent timing. I really like this one. Fantastic detail, David!